We’ve started our next renovation project. After addressing the damp on the walls by installing a curtain membrane and channel for any moisture from the stones to drain away, we’ve fitted a replacement window and started the studwork. Next we will fix insulation, lay the floor, hang walls, and address electrics and plumbing. The first time I looked out of the newly fitted window, I was greeted with a wondrous sight. Not just a stunning view through clear glass; there was something especially cheery about the landscape. 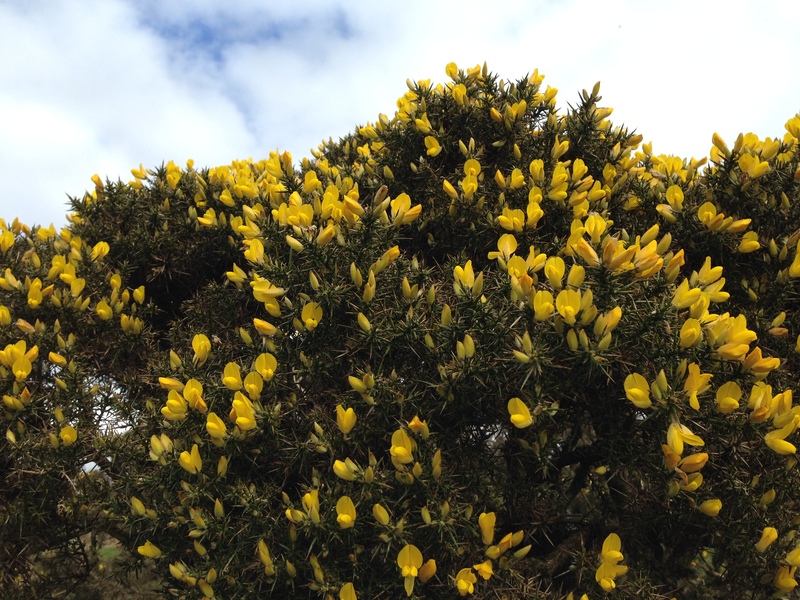 The Gorse bushes, which are everywhere on the hillside around us, had burst over night, as if by magic, from evergreen into their golden floral display. Gorse lining the track to Crockern Farmhouse. In late autumn and into the harsh winter months, there are always a few flowers dotted about the moors, but it is April and May when these plants erupt into their full flowering. There is an old saying, “When gorse is out of blossom, kissing’s out of fashion.” So, it’s always a pleasure – nay, a thrilling relief — to see these little yellow flowers in and amongst the snows of winter. At this moment, the showy flowers are everywhere, so pucker up! 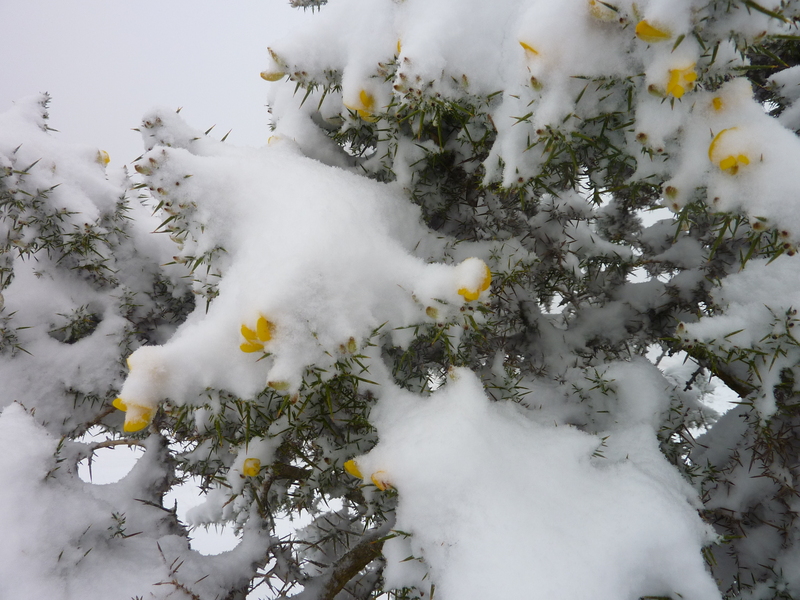 Gorse blooming in winter snow. What an impact this plant has on the landscape, both in colour and scent. There is a distinctive coconut smell, fragrant to some (Roger) and weak to others (me). Along with heathers, these are the plants we think of on wild, windy, and open moors and this landscape certainly would be lacking something significant without them. It characterizes the scenery, and with its spiny, needle-like leaves, provides dense shelter and food for insects and birds such as Warblers, Stonechats and Yellowhammers, the last of which will return soon to our bird feeders. Even the wild Dartmoor ponies forage gorse, eating the thinner stems especially in winter. Since the flowers are edible, I may throw a few into a salad. In addition to this first bloom of gorse, and completing one major project only to start the next, we have kicked off the warmer seasons by firing up the hot tub. We gave the hot tub a little clean, filled it up and had our first soak of the year. We sat in the warm water; occasionally feeding logs onto the fire to heat the water, and watched the light fade over the hills. The bats emerged from their roost zooming past with such speed the insects didn’t stand a chance. To bring the hot tub up to temperature and maintain the warm water for several hours takes about the same amount of wood we would use in an evening in the wood burner. 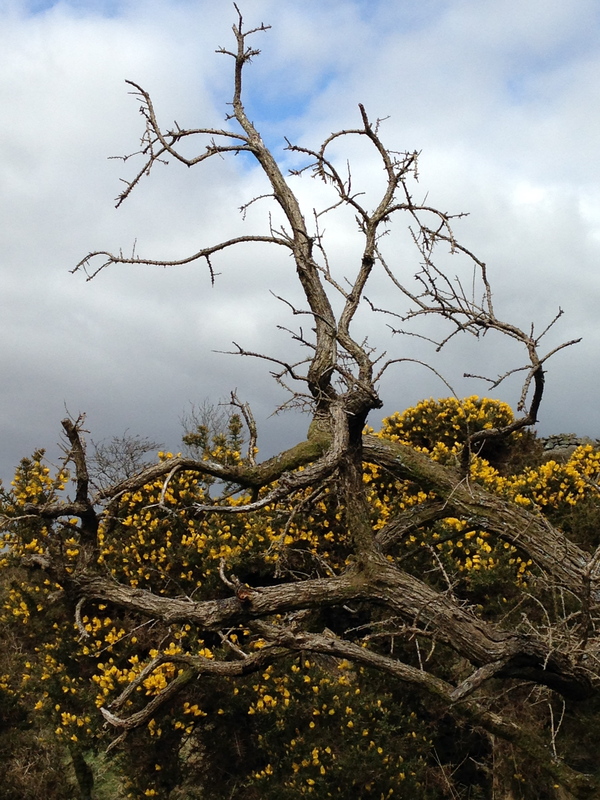 But unlike the need to burn seasoned hard wood, we may consider using some of the dead gorse to heat the hot tub. Before the Industrial Revolution, the highly flammable gorse was used as fuel firing traditional bread ovens and kilns. So, why not our hot tub? After two years of living at Crockern, we’ve discovered a few things that are predictable, namely the weekend parade of tourists. Every Saturday and Sunday we witness people miss the footpath running next to the leat on the other side of the valley. Rather than make their way along this gentle path into the dark woods, they seem to choose what, at first glance, must appear an easier path, if only because you can see the road in the distance. We watch lost hikers spend time negotiating their way down the very steep hill covered in reeds, gorse, followed by low lying bog water. We watch them encounter the river, which then needs to be crossed. We watch people contemplate false trails through minefields of ankle twisting ground. We watch as arguments commence, despite the blooming gorse that permits kissing. We watch as some return back up the hill and start over. We watch as others throw their packs across the river and then take their first step onto a slippery rock surrounded by cold water. We watch the occasional splash. On one occasion out in the yard, Roger was sanding a door and I was planting potatoes when we spied a couple with their dog clamber down toward the river. “It’s just the place for an Ambush.” remarks Christopher Robin as he leads an expedition in Winnie The Pooh, along a similarly steep, rocky, and treacherous non-path. Winnie the Pooh, who believed an Ambush was indeed a Gorse bush, was sternly rebuked by Owl “My dear Pooh,” said Owl in his superior way, “don’t you know what an Ambush is?” But for Pooh, the true meaning of Ambush is the gorse-bush, the very one which sprung up suddenly when he fell from a tree. The man in this couple may well agree with Pooh, as a prickly gorse bush following his rather unfortunate, yet spectacular, misstep ambushed him too. Later, as Sam and I walked down the track, surrounded by very old, tall thickets of yellow gorse and budding Rowan trees, I heard a familiar sound. Looking up, I saw the first of our returning swallows. They are back and we are looking forward to their summer visit. I joined Roger at the picnic table. We sipped our wine, watched the swallows and Roger worked on carving a spoon out of a piece of oak. 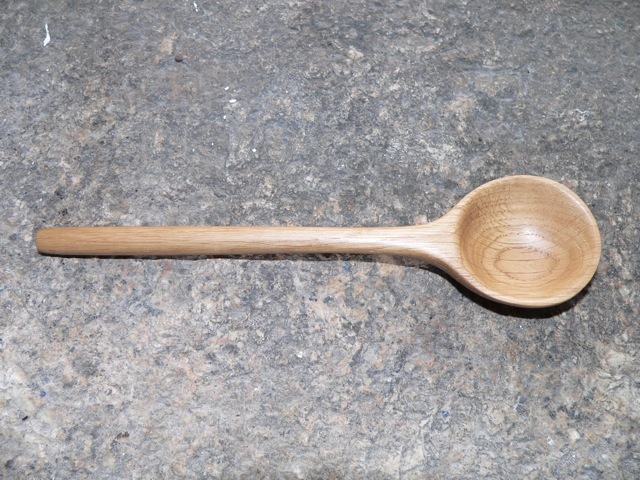 Perhaps his next spoon will be from gorse? 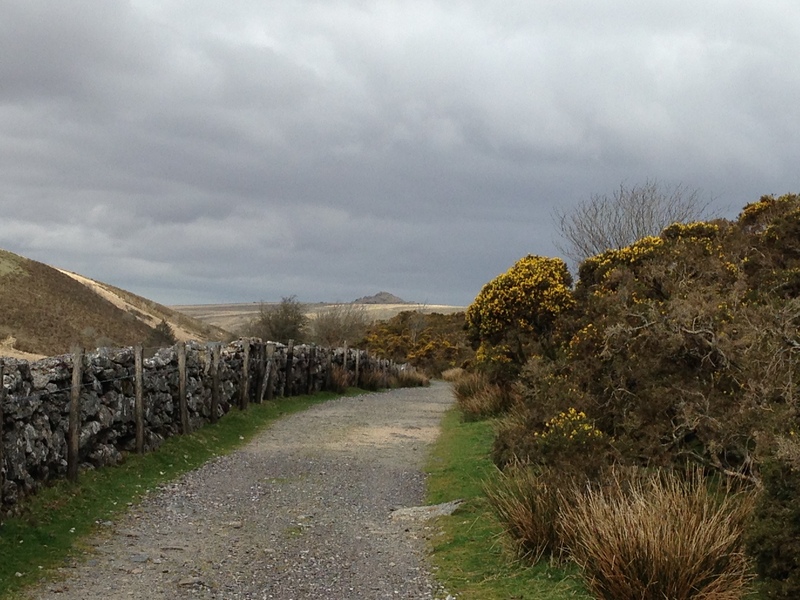 Gorse in bloom, and not, on Dartmoor. Rub’a’dub in da Hot Tub!